Front row! This harbour view is hard to beat in Raglan!!! 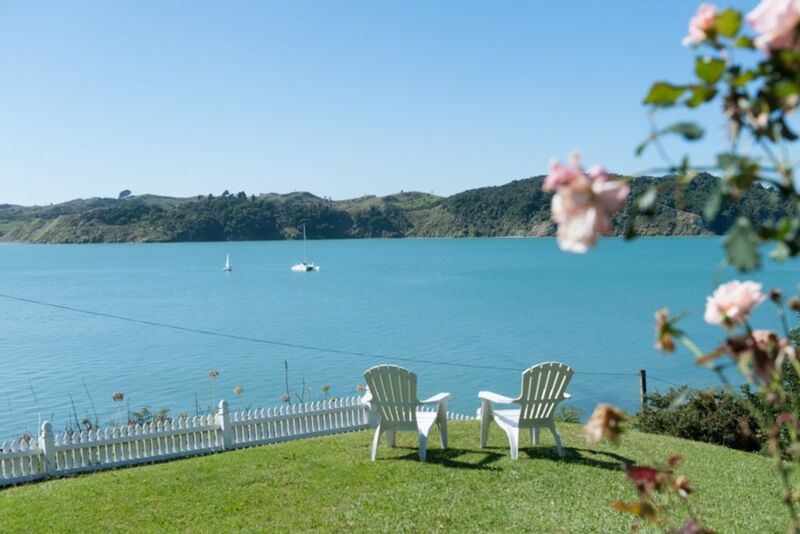 A lovely holiday home with iconic Coxs Bay at the bottom of the garden with safe swimming and kayaking. A charming house with stunning 180 uninterrrupted harbour views, set at the end of a sort after cul de sac. The home offers a generous comfortable living space, which opens onto a large deck overlooking the water. The deck is perfect for entertaining, dining, reading a book, watching people swim and the boats go by. You can take a 5 minute walk along the beach to the wharf for coffee or fish and chips, or walk to other lovely bays and town. In the winter there is a fire to keep you cosy, while you snuggly up and watch the harbour and water activitites. There is ample off street parking for your boat, which can be launched only a few minutes away at the wharf. You will find everything you need here for a fun and relaxing Raglan holiday, and take home great memories! Extra clean toilet available just outside the back door. Lovely house with everything we needed. Spent most of our time on the Deck appreciating the Fabulous view. We look forward to returning Daisy in the future. Love Raglan! Wow! What a view! We loved sitting on the deck and enjoying the incredible view. Also great to be able to walk 15 mins along the coast to the pub at Raglan Wharf. We would definitely return. Although the property is generally ok for kids, there is a very steep slope in the garden that a small child could fall down. We had to keep a close reign on our 2 year old when she was in the garden. The property had everything we needed. Careful with fridge temp as it froze all our veges. Lovely place with gorgeous outlook! Well equipped with everything you need. Beautiful house with plenty of space and awesome views. Great kiwi bach, the large shaded balcony provided all day cover whilst enjoying the amazing views. great facilities to accommodate 2 families, clean with lots of space. Our children ranging from 2-5 could wander down to the safe harbour beach independently and loved this freedom whilst we could keep an eye from the deck. Definitely had the relaxing easy holiday we were hoping for!